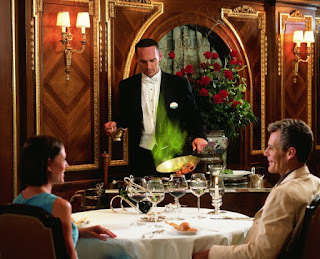 I love the dining experience aboard Celebrity Cruise Line ships. The main dining room food is delicious and the service, exceptional! I will go a step further by saying that the specialty dining experience is second to none! Celebrity recently announced new Specialty Restaurant Packages that make the additional cost more palatable, giving everyone a reason to give it a try! The new specialty restaurant packages represent a significant discount when compared with the cost of booking reservations individually onboard, and allow guests to bundle their specialty restaurant visits into one convenient price. Packages vary by ship and the price includes cover charges and dining gratuities. A three-meal package begins at $109 per person ($36.33 per day) and goes up to 14 dinners for $336 ($24 per day). The new pricing for Celebrity specialty dining packages goes into effect in 2017.